A fish has to be tempted to take the bait offered on the hook. And here comes the problem: what bait to use? The range of bait is many and varied. There are anglers who rely on the same bait every trip. There are others who say if the bait is presented properly then any bait will catch a fish. The flowing current of rivers and streams and the still water of ponds and lakes will contain an abundance of natural food for fish. Worms, beetles, snails, slugs and a vast array of other mini- beasts drop into the water from the bank. From the air and overhanging branches and bushes flies, spiders, butterflies and grubs will fall on the surface. Anglers have used natural food as bait for centuries. The garden worm has always been the traditional bait. There are two kinds of worm that are very effective for catching fish: the lobworm and the redworm. Lobworms can be found under stones or dug from soil. On wet days lobworms can be found on grass lying outside their holes. The best place to find redworms is in the compost heap. If you are not planning to go fishing straight away, keep the worms fresh in a bait box by covering them with damp soil or moss. The maggot is probably the most popular bait for coarse fishing. They are available at tackle shops. They stay on the hook well and almost all species of freshwater fish can be caught using maggots. They come in different colours such as yellow, pink and green and there are occasions when fish will be very choosy and only go for a certain colour of maggot! 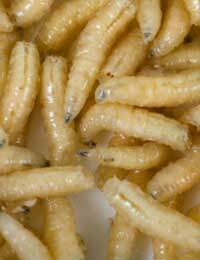 Depending on the temperature, maggots can be kept for three or four days before they turn into casters. Caster is the term used by anglers to describe the chrysalis stage of the maggot. Casters are a successful bait for catching roach, dace and bream. Apart from gardens and tackle shops, kitchen cupboards and supermarket shelves can also be places to find bait. Bread is cheap, plentiful, clean and easy to use. Many species can be tempted by bread but it is a particularly favourite bait for carp and tench. Cheese moulded onto the hook stays on longer than bread and often proves irresistible to chub. Some anglers believe that if the cheese is smellier it will pull in more fish. Chub can also be taken on luncheon meat and this has become standard bait for barbel. Used straight from the tin, other varieties of meat such as chopped ham or pork can also account for good catches of coarse fish. There is always the extra benefit when using "cupboard bait": if the fish don't go for it, well, you can always eat it yourself! If you want to catch a "monster" fish like pike, catfish, zander or eels then "monster" bait is needed. Minnows, bleak and young roach can be trapped or caught then put on the hook as dead bait. Larger fish are usually predatory and will snap up smaller fish offered to them. There are many types of bait to choose from and it's good fun to experiment and often there can be surprising results. Eventually, anglers always find their favourites.